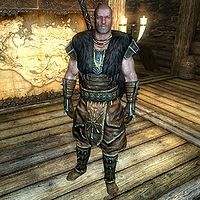 Gonnar Oath-Giver is a Nord soldier and a Stormcloak commander. Initially, he is found at Mistveil Keep. Should the Empire gain control of Riften, he will relocate as the commander of the Rift Stormcloak Camp. He is clad in a set of Stormcloak officer armor, along with matching pairs of bracers and boots. He is equipped with a hunting bow complete with twelve steel arrows, a steel dagger, a leveled weapon up to steel in quality, and either a hide or steel shield if he has a one-handed weapon. He remains essential even after the civil war questline is resolved, potentially resulting in an unwinnable fight. This page was last modified on 20 February 2015, at 10:06.